The velocity ‘v’ of the proton is to be found first using the expression for kinetic energy E (in joule). Note that E = 2 MeV = 2×106×1.6×10–19 joule. We have E = ½ mv2 from which v = √(2E/m) = [2×2×106×1.6×10–19/(1.6×10–27)]1/2 = 2×107 ms–1. F = 1.6×10–19×2×107×2.5 = 8×10–12 N.
Note: In the above question we did not take the relativistic increase of mass of the proton into consideration. Since the energy is 2 MeV only and the proton is is fairly heavy, the relativistic increase of mass will be about 0.2% only and you will obtain the velocity of the proton of 2 MeV energy as 1.995×107 ms–1. So, the magnetic force will be slightly reduced. If you calculate the velocity of the electron without considering the relativistic increase in mass, as we did in the previous question, you will get (nearly) v = 8.39×108 ms–1 and the magnetic force F = 3.35×10–10 N, nearly. But, the velocity is more than the velocity of light in free space and therefore is absurd. So, (c) is not the correct option. Therefore, m = 9.1×10–31 + (2×106 ×1.6×10–19)/(3 ×108)2 = 9.1×10–31 +3.55×10–30 = 4.46×10–30 kg. Note that the mass of the electron has become nearly five times its rest mass. The magnetic force on the electron is qvB = 1.6×10–19×2.93×108×2.5 = 1.17×10–10 N.
A very long, thick, cylindrical conductor of radius ‘a’ carries a direct current ‘I’. The magnetic field produced at a point P by this current is plotted against the distance of the point P from the centre of the conductor. Which one of the following graphs gives the correct variation? B = μ0I/2πr, where μ0 is the permeability of free space and ‘r’ is the distance of the point from the centre of the conductor. So, the field outside is inversely proportional to the distance ‘r’. The magnetic field inside the conductor can be found using the above expression itself by substituting for ‘I’ as the current carried by the cylindrical portion of the conductor having radius ‘r’. Therefore, in place of ‘I’ you have to substitute (I/πa2)(πr2) = Ir2/a2. Thus, the field inside, B = μ0(Ir2/a2)/2πr = μ0Ir/2πa2. The correct option is graph (A). [The magnetic field inside or outside the conductor can be easily found using Ampere’s circuital law: Outside the conductor, since the current enclosed by the closed path of radius ‘r’ is the entire current ‘I’, you will write the law as B×2πr = μ0I and will obtain B = μ0I/2πr. Inside the conductor, since the current enclosed by the closed path of radius ‘r’ is Ir2/a2, you will write the law as B×2πr = μ0(Ir2/a2) and will obtain B = μ0Ir/2πa2]. You will find questions similar to this on many occasions. So, take a special note of this question. Since the maximum height is given as ‘h’, you can write the answer in no time as (mvcos45º)×h = mvh/√2. ½ Mv2+ ½ Iω2 = Mgh, where ‘M’ is the mass, ‘I’ is the moment of inertia, ‘ω’ is the angular velocity and ‘g’ is the acceleration due to gravity. (7/10)Mv2 = Mgx, where ‘x’ is the maximum height reached by the sphere. Therefore, x = 7v2/10g = (7/10)(4/3)(3/4)v2/g = 14h/15, since h = 3v2/4g. We have seen in the previous problem that the height is independent of the radius. The correct option is 15/14 (since we require the ratio h/x). You should note that the two bodies need not be of the same material as the work done against friction can be ignored. You may be using various Physics text books for your Class 11 and Class 12 studies, but you should definitely acquire NCERT Physics text books for obtaining high quality content covering your requirement to a very large extent. 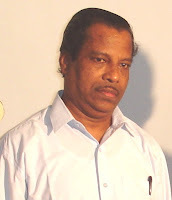 Generally, NCERT text books in various branches of science are of good quality as I could ascertain from my friends dealing with the subjects. As far as Physics (in Class11 and Class 12) is concerned, I can recommend the NCERT text books to you without any element of doubt. Fortunately, these text books are freely available online. You will find a link “Quality Books from NCERT” on the lower left side of this page, for this purpose. There is frictional force μma between the bodies A and B since there is a normal force equal to the inertial force ma which the body B exerts on A. Therefore, frictional force between A and B = μma = μmF/(M+m). [Note that the maximum value of the frictional force is equal to mg since it is a self adjusting force just sufficient to balance the weight mg of the body B and to prevent the relative motion between A and B]. Now, suppose the force F is less than the least value required to prevent the body B from sliding down. If it slides down with acceleration ‘a1’ and the coefficient of kinetic friction is μk what is the value of F? In the question discussed in the earlier post, the orbital radius was 1.02 R instead of 1.01R and the answer was obtained as 3%. You may work out the present question to obtain the answer as 1.5%. If you have any difficulty, see the earlier post dated August 30, 2006. You may easily do this by clicking on the label satellite below this post. mv2/r = GMm/r2 where ‘m’ is the mass of the satellite, ‘v’ is the orbital speed, ‘r’ is the orbital radius, G is the gravitational constant and M is the mass of the earth. From this v = √(GM/r). Since the change in ‘r’ is an increment of 5%, the change in ‘v’ will be an increment of – ½ ×5%, which means a decrement of 2.5% [Option (c)]. To obtain the electrons flowing in 50 s, you have to calculate the total charge flowing in 50 s.
Total charge Q = ∫Idt = ∫(4–0.08t)dt = [4t–(0.08t2/2)]. Since the limits of integration are 0 and 50 seconds, Q = 4×50–(0.08×502/2) = 100 coulomb. Since the electronic charge is 1.6×10–19 coulomb, the number of electrons flowing in 50 s is 100/(1.6×10–19) = 6.25×1020. Let us consider the second question first since it will give us the answer for the first question also. The entire heat energy absorbed by the sphere is not used in increasing its internal energy. A small portion is used to do work in expanding (against the atmospheric pressure). Normally we omit this small amount of energy since the expansion of a solid is small. But you have to calculate it here since you are given all data for calculating it. The rise in temperature of the sphere ∆T = ∆Q/mC where ‘m’ is the mass of the sphere. Increase in volume of the sphere ∆V = Vγ∆T = (m/ρ)γ(∆Q/mC) = γ∆Q/ρC. [The density ρ can be assumed to be constant as the temperature rise is small]. Therefore, work done against the atmospheric pressure = P∆V = Pγ∆Q/ρC. The increase in internal energy of the sphere = ∆Q – (Pγ∆Q/ρC) = ∆Q(1– γP/ρC). Now the answer for question No.1 is option (e) since the above expression for increase in internal energy does not contain the volume V.
This is a simple question and the most suitable option is (c) since the magnetic field (being parallel to the electron) does not exert any force, but the electric field decelerates the electron (since the charge on the electron is negative). Now, suppose the question setter had changed the last option as “not deflected but its speed will first decrease and will then increase”. Then, this last option would be the correct option since the electron would be decelerated first and then would be accelerated in the opposite direction. [Remember speed is a scalar quantity and the modified option takes advantage of this]. It is about a couple of months since I have been using Mozilla Firefox browser for my blog posts. I find it very convenient since it senses spelling mistakes in the posts and more importantly it saves a lot of time and effort for me when I deal with superscripts and subscripts. I should have known the possibilities of the Mozilla Firefox browser much earlier! A fixed thermally conducting cylinder has a radius R and height L0. The cylinder is open at the bottom and has a small hole at its top. 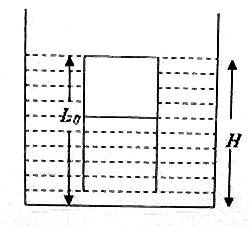 A piston of mass M is held at a distance L from the top surface, as shown in the figure. The atmospheric pressure is P0. Now, substitute this value of P in the relation, P0×2L = P×L’, where L’ is the final distance of the piston from the top. [Note that this equation follows from Boyle’s law]. L' = [P0πR2/( πR2P0 –Mg)](2L). The correct option is obtained by applying Boyle’s law. The initial pressure of air column of length L0 is the atmospheric pressure P0. The final pressure of the air column of length (L0–H) is [(P0+(L0–H)ρg] since the pressure of air inside the cylinder exceeds the atmospheric pressure by the hydrostatic pressure exerted by water column of height (L0–H). Applying Boyle's law, P0L0 = [(P0 +(L0–H)ρg](L0–H). Rearranging this you will get the equation in option (c). Most of you may be aware of the fact that the drift speed of electrons in a current carrying conductor is very small compared to the speed with which a current flows in a circuit. The drift speed is typically of the order of millimeter per second while the speed with which a current flows in a circuit is nearly equal to the speed of light. Understand that the electron need not move from one end of the conductor to the other end for a current to flow. What happens is that an electric field is established in each region of a conductor (at nearly the speed of light) and the electrons in the region drift under its influence. I = nAve where ‘n’ is the number of conduction electrons per unit volume, ‘A’ is the area of cross section of the wire, ‘v’ is the drift velocity of the electrons and ‘e’ is the electronic charge. From this equation, v = I/nAe. Since the atomic mass of copper is given as 63.5 g, the number of copper atoms in 0.0635 kg is 6.02 ×1023. The density of copper being 9×103 kg m–3, unit volume of copper contains (9×103/0.0635) ×6.02×1023 = 8.5×1028 atoms. Therefore, number of conduction electrons per unit volume, n = 8.5×1028 (since each atom contributes one conduction electron). Therefore, drift velocity, v = I/nAe = 4.4/[8.5×1028×π(1×10–3)2×1.6×10–19] = 0.1×10–3 ms–1(nearly). The drift velocity is given by v = I/nAe. Since the wires are of the same material, the number density (n) of conduction electrons is the same. The electronic charge (e) is a constant. The current and area of cross section are doubled. Therefore, the drift velocity is unchanged. Simple questions often make even fairly intelligent students commit mistake and this is one such question. The crucial point you must note is that the common temperature of A and B is unchanged when C also is kept in contact with them. So, the common temperature of A and B must be the same as the temperature of C which is T3. The initial heat content is (mc1t1 + mc2t2 + mc3t3) where ‘m’ is the mass of each liquid. The final heat content is (mc1 + mc2 + mc3)t where ‘t’ is the common temperature after mixing. [We have taken the reference heat energy level at zero degree Celsius]. 1000×(25×10–2)2×B×100π = 200. [The value of ‘ω’ is obtained from the form of the equation for the emf]. In an LR circuit the direct current is limited by resistance only. On applying a direct voltage of 200V, the current flowing is 1 A which means that the resistance of the coil is 200 Ω. Therefore 0.5 = 200/√[2002+(2√3/π)2 ω2] = 200/√[2002+(2√3/π)2 (2πf)2], from which f = 50 Hz. This question is quite simple and straight forward. Impedance, Z = √(R2+L2 ω2) = √[(302+(0.4/π)2 (100π)2)] since ω = 2πf =2π×50 = 100π. This gives Z = 50 Ω. Current I = V/Z = 200/50 = 4 A. This question also is quite simple and can be worked out within a minute. Primary current IP = (5000 watts)/(200 volts) = 25 A. Secondary current = (5000×0.8 watts)/(250 volts) = 16 A. [Note that the output power from the secondary side is efficiency times the input power]. The coin will start slipping when the centrifugal force begins to exceed the frictional force. In the limiting case therefore, mrω2 = μmg where ‘m’ is the mass of the coin and ‘ω’ is the angular velocity of the turn table when the coin begins to slip. But, ω = ω0 + αt = αt since the initial angular velocity (ω0) is zero. [Note that the above equation is similar to the equation, v = v0 + at in the case of linear motion]. mr(αt)2 = μmg from which t = √(μg/α2r). This problem is very much different since gravity is negligible. In the previous problem, the normal force that produced friction was the result of the weight of the coin where as here it is produced because of the inertial force produced by the acceleration of the rod. When the rod rotates with an angular acceleration α, the coin presses against the rod with an inertial force equal to ma where ‘m’ is the mass and ‘a’ is the tangential acceleration of the mass. But, ω = ω0 + αt = αt (since the initial angular velocity ω0 is zero); a = αr. Substituting these we obtain αt = √(μα) so that t =√(μ/α) . Many among the visitors of this site might have already noted that the posts here are useful for preparing for the AP (Advanced Placement) Physics Exams. Even though you find multiple choice questions here, you will definitely find the posts useful for answering the free-response section of the exams since the questions are answered with all necessary theoretical details. In many cases the discussions touch even minute details. This is done for helping students who are just above average. The needs of those who appear for the AP Physics Exams will be considered while discussing questions here. You may make use of the facility for comments for communications in this regard. At the instant of collision, you need consider the two identical colliding masses C and A only. As the collision is elastic, the entire momentum and kinetic energy of C are transferred to A and C comes to rest. The block A then moves towards B, compressing the spring. When the compression is maximum, both A and B move with the same velocity. mv0 = (m + m)v where ‘v’ is the common velocity with which the masses A and B move. Therefore, v = v0/2. ½ mv02 = ½ (m + m)(v0/2)2 + ½ kx2, where ‘x’ is the maximum compression. This gives x = v√(m/2k). This MCQ appeared in the Kerala Engineering Entrance 2003 question paper. p1 = P – p2 where P and p2 are respectively the final momenta of the nucleus and the α-particle. (The negative sign for p2 is because of the backward motion of the α-particle after the collision). But the magnitude of p2 is p1/2 since the final kinetic energy of the α-particle is ¼ of its initial kinetic energy. [Remember that K.E. = p2/2m and hence the momentum p is directly proportional to the square root of the kinetic energy]. Therefore, P = p1 + (p1/2) = (3/2) p1. Since the collision is elastic, kinetic energy also is conserved. P2/2M = (3/4) p12 /2m where ‘M’ is the mass of the nucleus. This gives M = 3m.